"Dr. Llaurado and his staff are wonderful!" "Dr. Llaurado runs a friendly and efficient practice." "He Is fantastic! I go to him for botox and fillers and have been so pleased." "Dr. Llaurado and his staff are a pleasure to be around." "Fabulous staff and Dr Llaurado has great skill and fabulous bedside manner!" Dr. Raymund J. Llaurado is a board-certified facial plastic and reconstructive surgeon practicing in Arroyo Grande, California. Dr. Llaurado is dual-certified in both otolaryngology-head and neck surgery, and facial plastic and reconstructive surgery. Dr. Llaurado earned his bachelor of science degree in biology with honors from the University of California, Riverside. He went on to obtain his doctor of medicine degree from the Medical College of Wisconsin in Milwaukee. Dr. Llaurado moved back to California to complete his residency in Otolaryngology-Head and Neck Surgery at the Loma Linda University School of Medicine in Loma Linda, California, where he went on to become an associate professor of surgery and the interim Chief of Otolaryngology-Head and Neck Surgery. Always dedicated to advancing his knowledge and skills to serve his patients efficiently, Dr. Llaurado finished his fellowship in facial plastic and reconstructive surgery at the prestigious McCollough Institute for Appearance and Health in Gulf Shores, Alabama. Combining his education, experience, advanced technology and tools, with a passion for his field, Dr. Llaurado provides effective treatments and procedures that deliver excellent results in a safe, compassionate environment. Dr. Llaurado opened his practice in Arroyo Grande, California to provide state-of-the-art nasal and facial plastic surgery on the central coast. He’s currently welcoming new patients and looks forward to creating a custom treatment plan for you. Call or book your consultation online today. 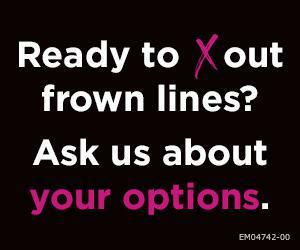 Say hello to XEOMIN®, a uniquely purified choice for frown lines. We accept all insurances. If you have any questions regarding insurance coverage, please call our office. We are happy to help.